Hmm … Sitting under the kitchen bench with a green crayon comes to mind. In school I remember competing with other kids to see who could draw the best monsters. And then I spent a lot of time growing up sitting at my Nana's dining table after school drawing all sorts of stuff, or sitting on my bed in high school listening to tapes and CD's, filling sketchbooks with comic book characters before the days of infinite distractions. I've got a pretty well-established process now which I've been using for a while. First I read the story (kind of an important step!) and get a general impression. Visual ideas will already start suggesting themselves at this point but I'll read through the piece again and write a list of any of the words in the piece that seem important. At the end of that, I try to write a single word or short sentence that captures the mood or theme of the story for me. It's usually that core idea or mood that is the main point of inspiration. It's important for me to create an illustration that complements the writing rather than competing with it, and often that means looking for ways to convey the feeling of the story in a way that isn't just a depiction of the events in it. Anyway, once I've worked out what I think the mood or theme of the piece is, I'll do a whole bunch of small, very rough sketches called thumbnails. Once I've got an idea I'm happy with I'll do a bigger drawing in my sketchbook, scan that in and finish it up in Photoshop. Well at the moment my favourite street artist is Aryz, my favourite painter is Mark Maggiori and my favourite illustrator is Rich Kelly. But I'm inspired by huge number of artists and my favourites change all the time. These days there's so much out there it's worth bookmarking a few art blogs and checking back occasionally, or following them on Facebook or Instagram if you're a fan of the social media. I like booooooom.com, with seven o's. There were a few that I was happy with. I liked my piece for The Roommate by Adam Meyers because I could relate to the story pretty well, and because I ended up going with a more simple and conceptual approach than I normally do. I also liked The Eighth Hole by Dominic Carew because it felt like there wasn't much for me to add, without taking away from the writing. I ended up just drawing an empty, moody golf course which I felt complemented the story. 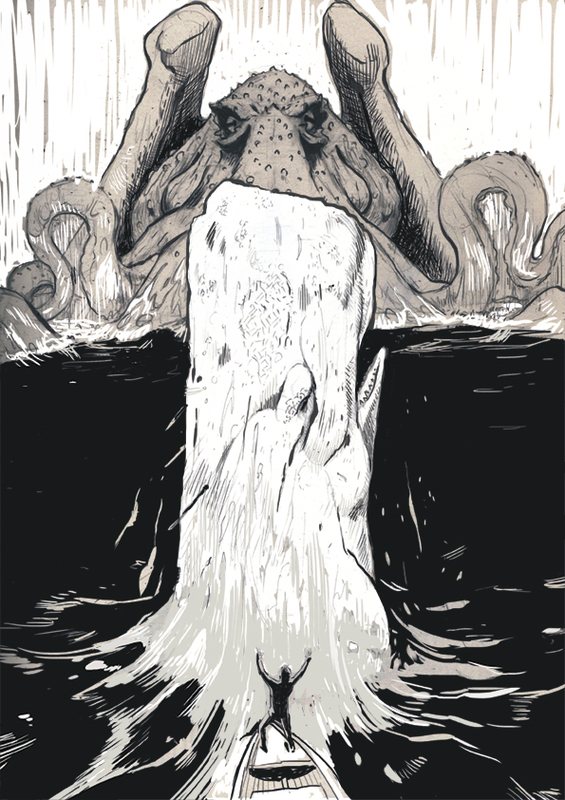 And the last favourite was the lucky last – The Ture by Mason Masters because I got to draw my first ever Cthulhu! Do check out each Flasher that Luke worked on!